Today we had a quiet day. Not quiet volume-wise, just not busy. These are some of my favourite days; when I hardly pick up my phone and spend less time stressing about my grown-up world and more time enjoying my toddler’s world. We had a picnic in the living room with his teddies and babies (apparently you’re meant to say babies these days, not dollies. Who knew?) 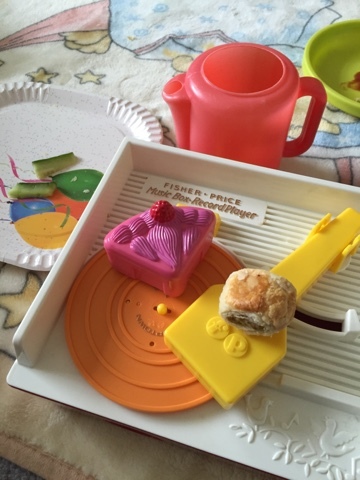 and the Fisher Price record player blaring out all the big tunes: the Grand Old Duke of York and Camptown Races (you’d recognise it if you heard it). All killers no fillers. It could’ve been a perfect Instagram moment, except we’re not a perfect Instagram family. I’ve recently got Primo hooked on tomato ketchup which experts warn is an entry sauce and could lead to use of harder condiments like brown sauce and that fake Big Mac one. So the ketchup was smeared all over his face (strike one) while he dipped his sausage rolls (strike two) in it, he threw a ramekin of cucumber sticks into the fire (strike three) and took his socks off and dipped them in the tomato sauce too (definitely sent off the field of Instagram parenting now). But of course, these days aren’t always for Instagram. And that’s ok with us.